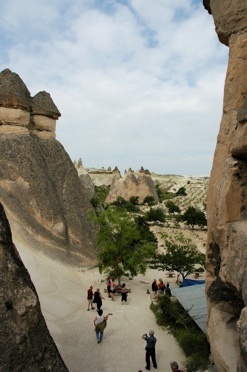 Kapadokya (Cappadocia) in Turkey is a magical land known to mostly everyone. The impressive hooded, natural rock formations some call “fairy chimneys” are certainly part of the draw and the geological mystery that bring so many tourists to this destination located in the heart of Central Anatolia. But there is more. The valley and national park of Göreme, a UNESCO World Heritage site, is also a cultural hotbed, a multi-cultural and multi-religious site that has been a fascination to many historians and archeologists for many decades. What is especially interesting is the history of the region that has been a home for Jewish, Christian and Muslim civilizations throughout its long history. The region is a shocking reminder of what Anatolian people are about, a fascinating cultural and historical diversity and a strong drive towards beliefs. Some believe the name Kapadokya came from a persian word that meant “home of beautiful horses”. Many civilizations including Hittite, Romans, Byzantine and Selcuk (early Turkish civilizations) made it home in Kapadokya over its long history. The region is also known as one of the first settlements for Christians during the birth of Christianity. Hundreds of underground tunnels that are still in use today and some you can visit were created by early Christian settlers to escape from prosecution. 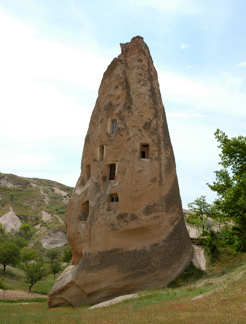 The homes and churches carved into these rocks, the stunning paintings on the walls of these establishments, the underground tunnels and burial grounds and the story of people who lived in these historical cities and tunnels as they tried to defend what they believed in, make this location a not-to-be missed site for your next visit to Turkey. The cool air in the underground tunnels, the hair-raising burial grounds and the stories of the early civilizations, how they lived and what made them build these underground cities are sure to give you a spine-chilling but unforgettable day. A popular activity to take in the stunning beauty of the region is taking a hot balloon trip over the impressive landscape. The ride will certainly make this trip exactly the fascinating vacation you would remember in many years to follow. Until then, if you want to take a tour of the region, please enjoy this UNESCO Video of the sites in Kapadokya. With this article, we are proud to be kicking off a new series aimed to introduce you to unique, stunning, unusual parts and locations of Turkey, starting with the UNESCO World Heritage Sites. Turkey has a good share of UNESCO sites in its vast history and strategic location. UNESCO has 11 Turkish sites inscribed as the World Heritage Site and 41 tentatively listed. We start our exploration of these sites with the Valley of Göreme, otherwise also known as Kapadokya (Cappadocia), located in the heart of Central Anatolia. Stunning rock formations are only part of the story here. Find out more here, about the history, the cuisine, unique travel tips and more. In this volcanic region, a layer of lava that covered a softer soil formed a strong, harder surface. Over centuries, the soil below the volcanic rock started eroding due to natural forces like wind and rain, leaving the lava rock as a cap on top of a cone like formation. Eventually, when the bottom tower structure could no longer carry the volcanic top, the volcanic rock top fell off. This is the story of how these stunning rock formations called “fairy chimneys”, otherwise also known as “hoodoos” came about with nature at work for over 3 million years! We have exciting news! Soon, we will explore the cuisine of Kapadokya with recipes and drinks from the local experts. Do you want to know more, cook and taste some of these recipes at home, and wonder what is to drink and what is so unique in the region? We will also bring you travel tips on your next visit to the region, to make sure you’re getting the best of it! Join us here at Foods of Turkey!